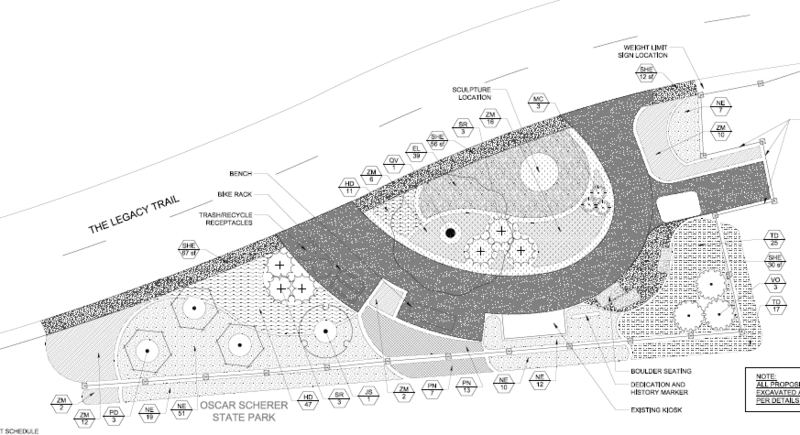 “The South Creek Stop Station and Learning Area” is being created at South Creek adjacent to Oscar Scherer State Park. Funding from the Jelks Family Foundation and Friends of The Legacy Trail is making this project possible. 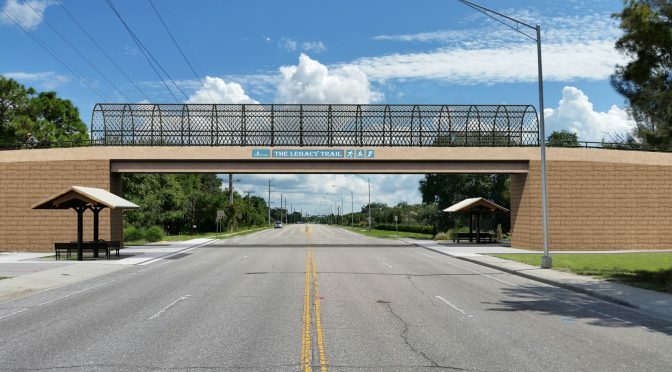 The area will include a bench, bike rack, kiosk, viewing area for the historic railroad trestle, various Florida native trees and plants and an official Sarasota County historical marker explaining the significance of the railroad to our community. 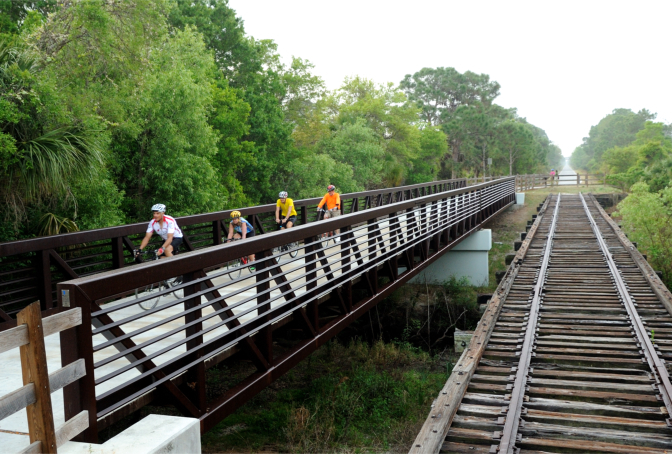 Trail users will be able to view the historic railroad trestle, learn about Florida native plants and relax in a natural, enjoyable setting. 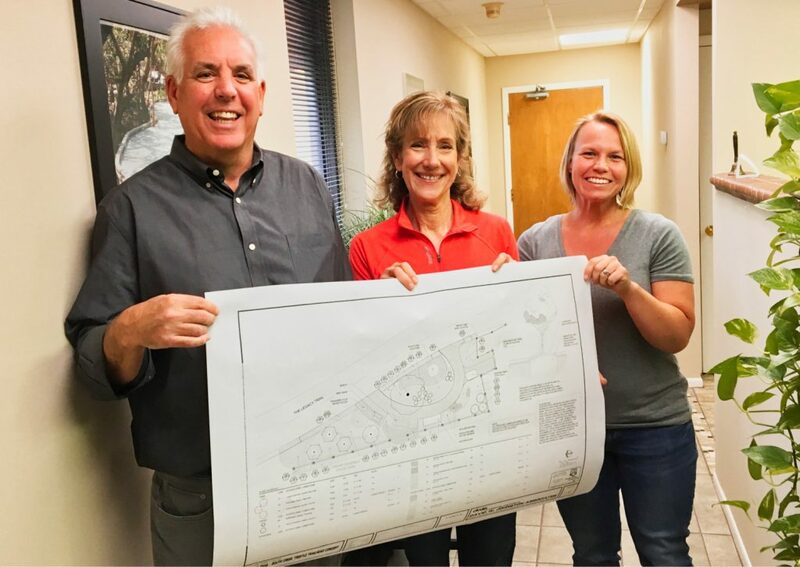 Phil Smith, State Licensed Landscape Architect, and Kate Johnston, Landscape Designer, from DWJA Landscape Architects have donated their time and expertise to create a site and construction plan. Sarasota County Parks, Recreation and Natural Resources staff have also been working on the design. Friends of The Legacy Trail will be managing the project. Darryl Lang, FLT Board Member, has worked tirelessly to get this project accomplished. Construction should begin in a few months. The Friends of The Legacy Trail Speakers Bureau is looking for individuals who are comfortable presenting to a wide variety of groups to spread the word and excitement about The Legacy Trail. 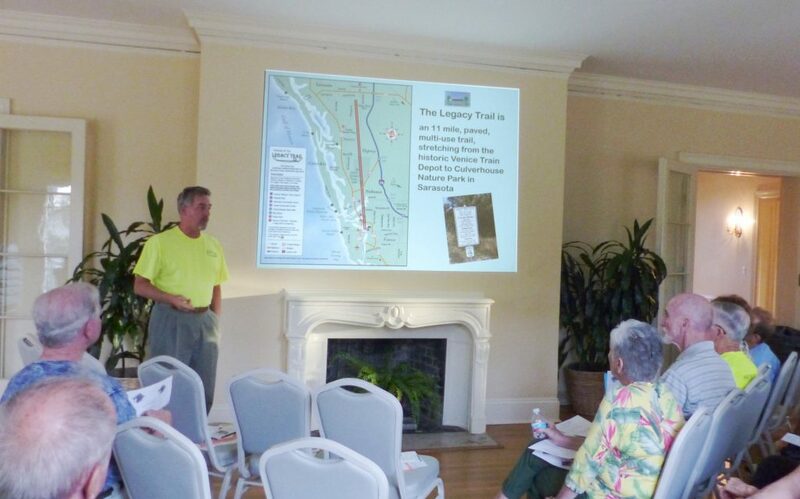 Our Speakers Bureau was a very big part of our work to promote the Legacy Trail Extension Referendum by informing Sarasota County Voters about the important facts related to the project. Although the Referendum has successfully passed, we continue to receive requests from community and neighborhood groups, service and business organizations, etc., to provide speakers to inform their membership about the trail. We have an important story to tell about our history as well as the ever-changing plans for the newly approved extension and possible connections to the trail. Keeping the public informed as we move forward is very important to our mission and helps us honor the support the voters have shown for The Legacy Trail. We have developed a Power Point presentation that helps tell our story and we will provide the equipment and materials for these events. Sound interesting? Need a little more information? Let us know! Contact us here. We will work with you to become familiar with the materials and make sure you have all the information you need. Join us on Sunday, March 24, 2019 for the annual Tour de Parks Bike event. The ride features distances of 21, 35 and 62 miles, going through 12 scenic parks in Sarasota County. You may get more information and register now from here, or or go directly to Active.com. You can pay online, or download a form and mail it in. The ride will once again have a wonderful breakfast catered by First Watch, snacks at rest stations sponsored by Doctors Hospital and Lunch by Mattison’s. All this and a t-shirt (for the first 650 riders –size restrictions available on line) for $40 (plus Active fee). The prices go up starting February 28, so register early. 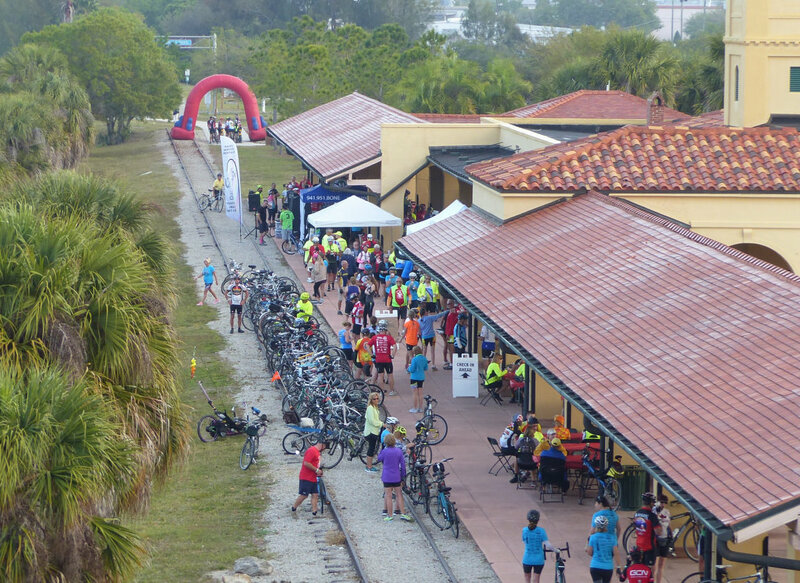 The ride will begin at the historic Venice Train station. The ride will be held rain or shine. Final Routes are still being confirmed and will be posted on our website. 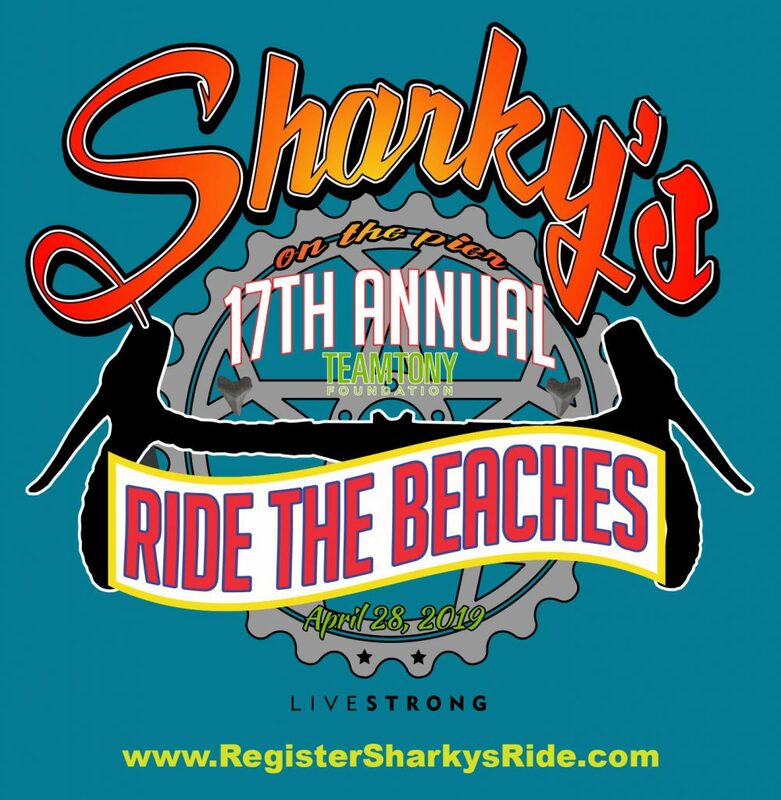 There will be packet pick-up prior to the event at Real Bikes, Bikes International and Sarasota Bikes. Details will be sent prior to the ride and posted at the link above. Last year we had close to 800 riders. We will have a Bespoke Jersey for sale and will have that information available on the website once the design is complete. If you would like to sponsor a mile marker or see other sponsorship opportunities, please contact Michelle Stanley. 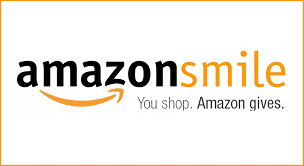 Make Contributions to FLT with Amazon Smile! No additional cost to you! But donations from Amazon Smile will go directly to FLT! It’s easy-start shopping! 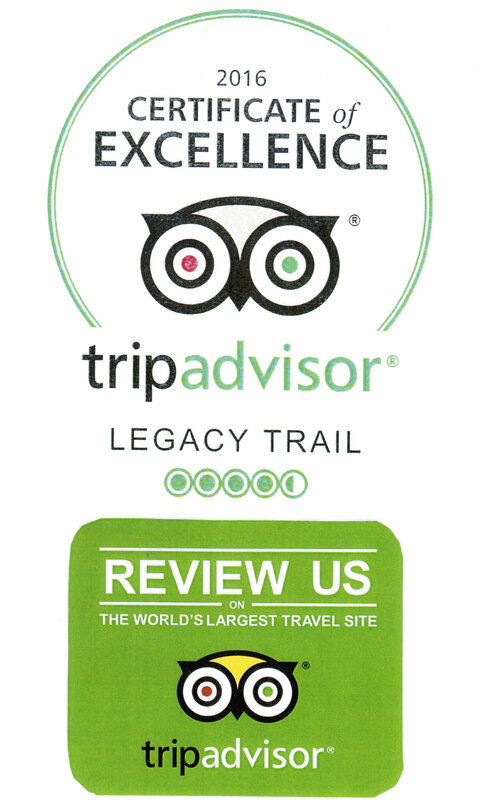 Select Friends of The Legacy Trail!! Thanks to Joan Attenberg for setting this up for us! 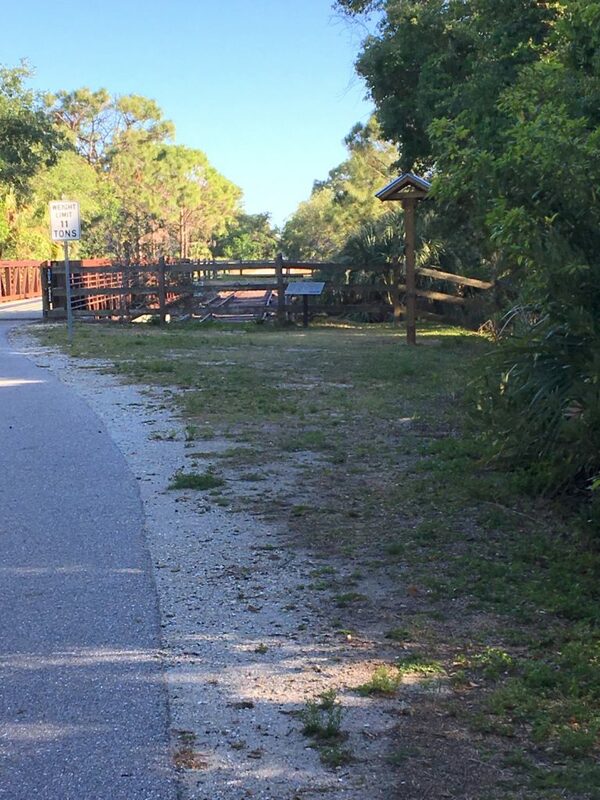 The popular Osprey Junction Trailhead will soon reopen with the completion of the Bay Street extension to Honore Ave. Palmer Ranch residents will have a new way to reach the trail, complete with bike lanes and a multi-use pathway. One downside, however, is the lack of bike and pedestrian infrastructure on existing Bay Street between the Legacy Trail and U.S. 41. This sleepy narrow street is about to get busy! A group of Osprey residents, alarmed by impending safety issues from increased Bay Street traffic, decided to do something about it. They raised the issue multiple times before the County Commission. They met with County staff. They engaged their fellow residents in the area. The county quickly agreed to re-stripe the road, add signage, and paint “sharrows” on the street. But a pathway or bike lanes were considered cost prohibitive. The group, organized as COTS, the Coalition for Osprey Transportation Safety, pressed on. Persistence paid! Commissioners eventually directed staff to find a creative solution. They did. Last week, following a public hearing, the Commission agreed to allow a developer on Englewood’s River Road to construct a Bay Street sidewalk in lieu of their obligation to build a sidewalk adjacent to their new development on River Road, which would connect to nothing and be replaced when the road is widened. 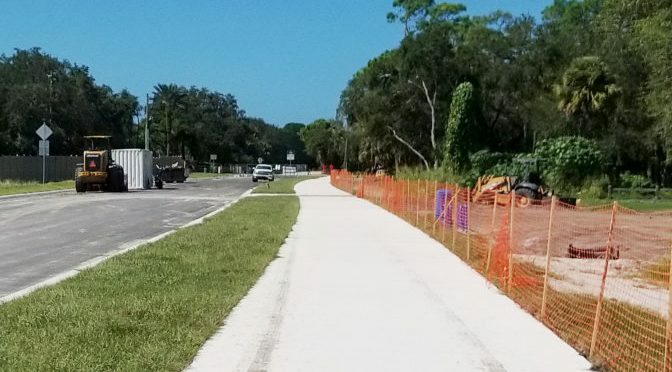 With this agreement, a 5-foot wide sidewalk will now be built along the north side of Bay Street between the Legacy Trail’s Osprey Junction Trailhead and Old Venice Road, offering a safer route for everyone. Completion is expected by February 2019. 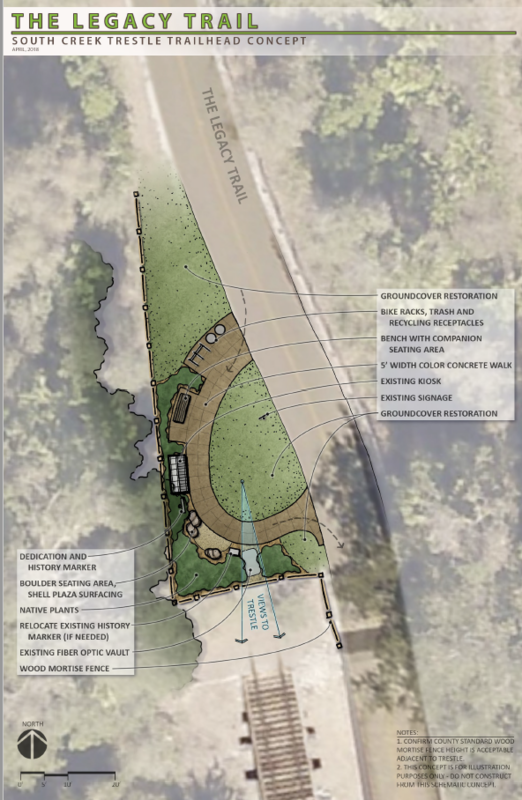 The donation will help sponsor a beautiful new landscaped stop station and learning center to be located in the grassy area just north of the train trestle adjacent to Oscar Scherer State Park. FLT will also contribute funds for this project. 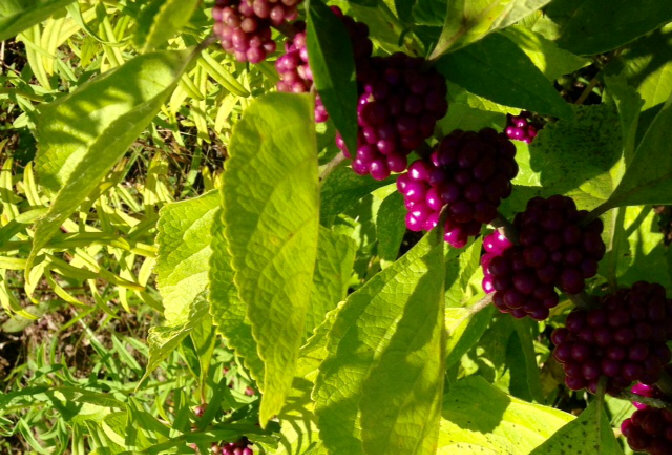 From Howard Jelks, Director of the Foundation, “Our family is very honored to participate in creating a place where folks using The Legacy Trail can learn about the railroads and native plant communities around them. Dr. Allen Jelks, Sr. is very active in railroading circles — both in remembering the past and promoting rail travel in the future. The late Dr. Mary Jelks was an energetic environmental activist who inspired others with her love and passion for natural plant communities”. We look forward to adding another great amenity to the trail. Thank you Jelks Family Foundation and all FLT donors who help make projects like this possible. 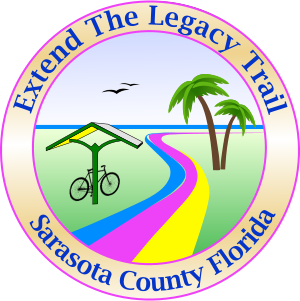 The Friends of the Legacy Trail have learned that there is a verbal agreement to new terms between Sarasota County, their partner Trust for Public Land, and CSX Railroad and their lessee Seminole Gulf Railroad, to acquire a portion of an unused rail corridor to extend the Legacy Trail into Downtown Sarasota! The new agreement replaces previously negotiated terms calling for a two-phased acquisition with $20 million for phase 1 by December 2017 and $18 million for phase 2 by 2019. The County had allocated $8.6 million toward the extension during 2018 budget review sessions earlier this year, but was unlikely to achieve the remaining balance by this December. They asked the Trust for Public Land to renegotiate the terms based on the available funds. The revised terms apply the available $8.6 million to buy the portion of the rail corridor from the northern terminus of the Legacy Trail at Culverhouse Nature Park, over Clark Road, to Ashton Road with closing in December 2017. 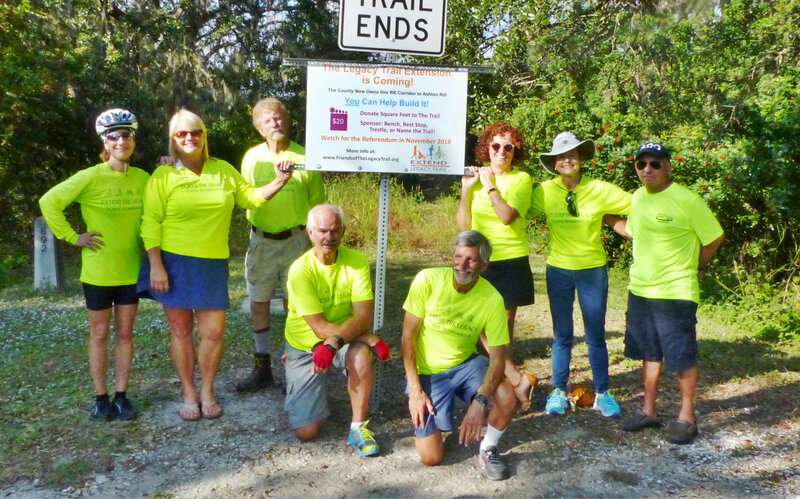 Once purchased, the County can begin applying for development and construction grants, and Friends of The Legacy Trail and our partners can begin fundraising in earnest for the extension. The parties are working to finalize the revised terms and conditions before submitting it to the Board of County Commissioners (BCC) for approval expected later in August. Stay tuned for further details, including the specific date and time for the BCC meeting. We will need all Legacy Trail Extension supporters to show up in Commission Chambers in their FLT yellow shirts to support this land purchase! For questions, please do not hesitate to contact us here. The county has started work today, August 8, to relocate utilities where The Legacy Trail crosses Laurel Road. This work is being done in preparation for building a Legacy Trail bridge over Laurel Road. The utility relocation work is expected to last approximately three months. The Legacy Trail intersection crossing Laurel Road will be closed, and trail users will be detoured to cross East of The Legacy Trail at Mission Valley Estates. For questions, call the Sarasota County Contact Center at (941) 861-5000. 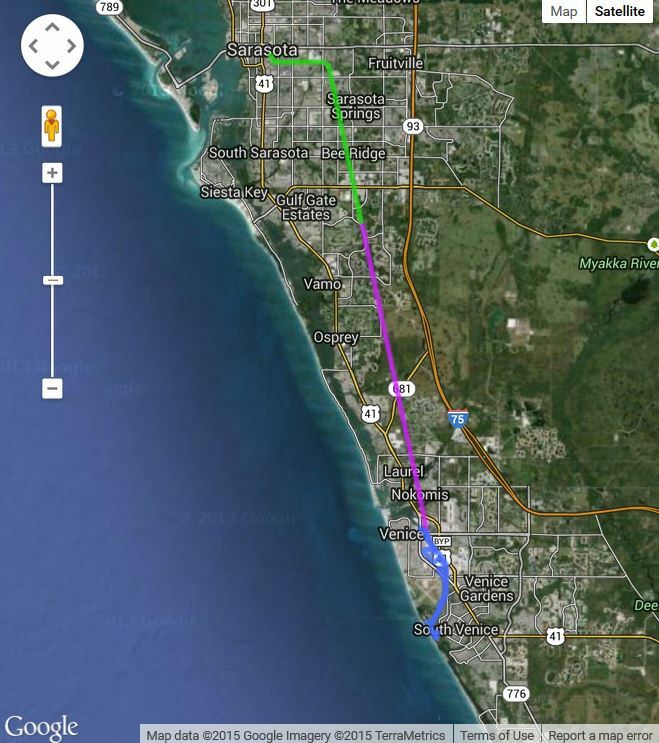 Bay Street, which extends from Tamiami Trail to The Legacy Trail Osprey Junction Trailhead (see map), is going to be extended east, across the trail, to Honore Avenue. The Osprey Junction Trailhead will be closed for construction starting August 2, 2017 and lasting approximately 12 months. 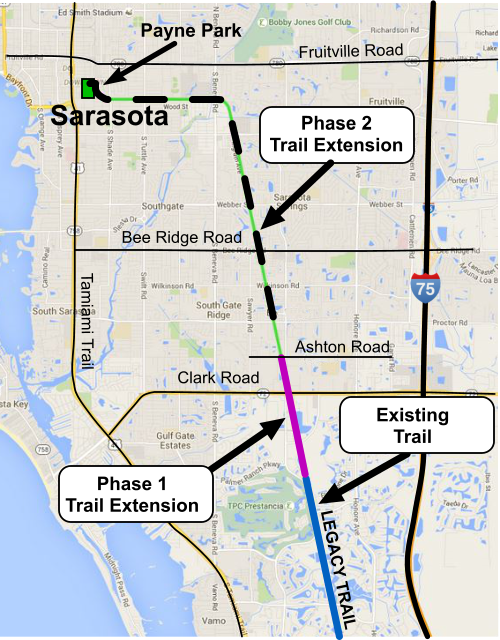 The Legacy Trail will remain open for the entire length of project. Starting approx. 8/1/17 the port-o-let will be removed from OJT/Legacy Trail intersection. In addition to this, all signs, picnic areas, kiosk and water fountain within the project corridor will be moved or removed and stored until end of construction. Pedestrian access from the existing Bay St. to the Legacy Trail will remain open but watch for signage as a new temporary access trail will be opened to the north of the existing access trail during road construction.